They look feathery feminine and flower-petal sleek. But make no mistake about it. Those shoulder-level adornments worn by Jennifer Lawrence’s Katniss Everdeen in The Hunger Games: Catching Fire are epaulets. Also known as epaulettes – the singular means “little shoulder,” derived from the French word épaule; the feminine “ette” has très appeal – these devices clearly are under the domain of Mars, the archetypal ruler of soldiers, leaders and weapons. Even the ancient Romans thought similarly strappy shoulder-things would work well on their military gear. Over time, epaulets sort of popped up as clusters of ribbons whose multiple ends looked like fringes. They further evolved as indicators of rank, depending exactly where on the upper body they were situated. Not surprisingly, epaulet design became important as soon as color, fabric and fringe length could help identify and single out the more distinguished leaders. The function of male avian plumage comes to mind. But Katniss is a gal, living in a dirt-poor district where the only items with half a chance of hitting her shoulders are chunks of bread thrown by Peeta. So how do her epaulets make a plot-tied and symbolic statement? Katniss’s gorgeous epaulet embellishments have been designed by folks at the Capitol, so it makes sense that, as Leadership Central, they’d be honoring the gal who, along with Peeta, is a Hunger Games victor. The Capitol and its inherent Arian aggression – Mars has a short fuse and will instantly take up arms to subdue even the slightest insurrection in the districts – impel headquarters to honor the returning champions. After all, victors have, at least on the surface, been as diabolically violent as the Capitol in bringing home their conquest. However, it’s noteworthy that, following epaulet tradition over the centuries, Katniss’ are placed at her shoulders, the body part ruled by Gemini, whose domain also includes arms, clavicle, hands and fingers. Trish Summerville, Catching Fire’s costume designer, was archetypally clever in aligning arms, as in Katniss’ bow and arrow – Mars’-ruled weaponry – with the part of the body typically used when leaders beckon troops to follow, either to maintain the status quo or to engender revolt. For gals donning epaulets, the trick is to wear them with balance. Venus rules the Libran scales, which should be weighed equally on each side. Katniss’ epaulets exude a Mars-and-Venus, fierce-femininity vibe. A little bit war god, a little bit Aphrodite. And, in the end, also quite a bit of Mercury, so that thinking on her feet is just as important as her Mars skills and Venusian grace. Goldie Hawn, playing the spoiled heiress who relied solely on Mars to commandeer her life in the movie Overboard, epitomized, via her gaudy ceremonial epaulets, how misdirected a choice the military thrust can be. Her shoulder ornamentation was so grandiose – she couldn’t get through a doorway walking straight ahead – that she had to riotously angle her body to make an exit. With Katniss, what you see in her epaulets is, well, what you can’t see coming. It’s about communicating (Mercury) her leadership (Mars) in a feminine (Venus) way that supports her values (Venus). It’s girl power at its best. 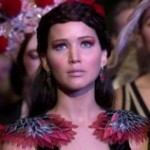 Interested in reading about Katniss’s gray shawl in Catching Fire? Click here.